The calendar says we are getting late on planting corn. While the soil conditions are probably more important than planting date, there will be intense pressure on producers to plant corn this week. That means that some fields will likely get planted too wet. Getting into a field too soon is completely understandable given the logistics of planting multiple fields and trying to "sneak in" a field between rains. Cutworm and Armyworm Moth Captures Drop…. But this is just the beginning. Capture of Armyworm (AW) and Black cutworm (BCW) moths at the UK-REC in Princeton have dropped back to near normal levels. This is to be expected and indicates the end of the migrator flight into Kentucky from further south. For both species we now wait and monitor for the appearance of the caterpillars. Heads up! The new FHB (Head Scab) forecasting tool has a new feature.You can select the FHB susceptibility level of the variety you have planted. The potential for farmers to lock-in substantial corn profits with a cash-forward contract has been limited so far this spring. Assuming the per bushel total variable cash costs plus per bushel cash rent for corn in Western Kentucky is $3.85/bushel, a cash-forward contract would not provide any cushion to cover fixed costs, service debt, provide for family living, and to fund future business growth. Fig. 1 Black cutworm moth. Black cutworm (BCW) and armyworm (AW) moths captured in the IPM traps at the UK-REC in Princeton, KY show a substantial increase for the trap week ending Friday, April 10th. 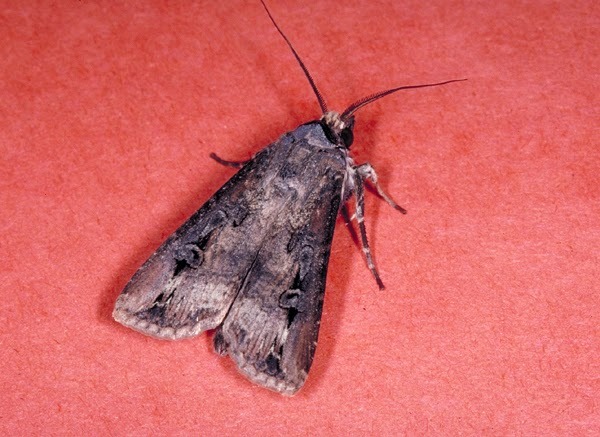 In the case of BCW, 37 moths were captured when about 8 would be expected. For armyworm, 541 moths were captured when 119 would be average at this time. Captures for both of these pests are significantly greater than their rolling five- year averages. In addition, if the armyworm counts continue to increase at this rate, the population will approach the outbreak levels seen in 2006 & 2008. These are years when known pest problems either caused loss or required extra insecticidal control. See the Insect Trap Graphs on the UK-IPM webpages. Over the past few months we’ve had farmers at each county agronomy meeting ask about liquid lime. After a little investigation we found out that what was being marketed as a liquid lime with neutralizing value was in fact calcium chloride (CaCl2). This was bad news because CaCl2 provides NO liming value and is in fact not “liquid lime.” Calcium chloride is used for many purposes including road salt or tractor tire ballast, it however cannot be used to neutralize soil acidity. This post is intended to provide some information on liming materials, the lime reaction, and explain why CaCl2 is not a lime source. For many producers, spring planting is late. While everyone is anxious to get a crop planted, corn yield may not be as tied to planting date as we think. In fact, planting into good soil conditions may be just as important as planting date. Over the past few years, farmers have sent me planting dates and yields from their fields. 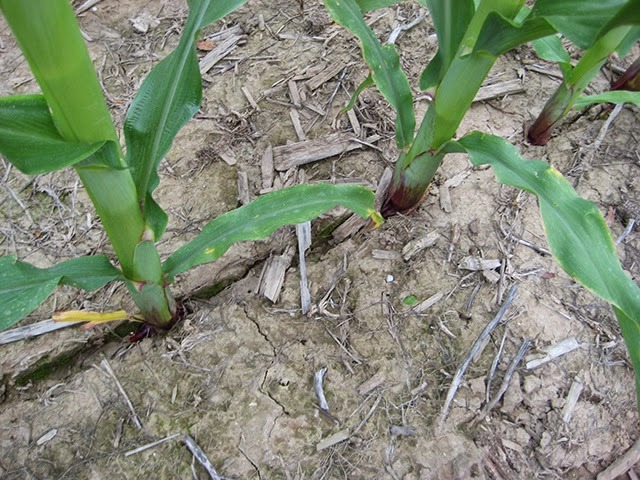 We found that planting date has little effect on corn yield. We had 625 fields from Central Kentucky where we compared yield to planting date. 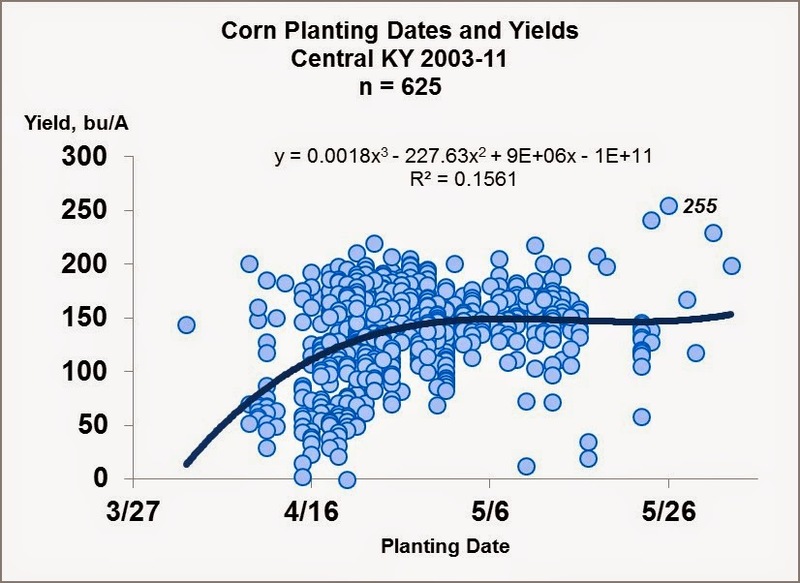 The resulting curve had an r-square of 0.0823, which basically means that there is no relationship between planting date and yield in Central Kentucky (Fig. 1). When comparing planting date to yield from 59 fields in the Green River area, the r-square was only 0.1512. Again, there is very little relationship between planting date and corn yield. With the heavy rains in the past few days and the rain forecasted for next week, producers are wondering how much of the applied N has been lost.